Years ago, when I was taking a photography class and we were shooting on slide film, the instructor told us that Fuji film leaned towards green tones and Kodak film leaned towards blue tones. Well, it's looking very, very "Fuji" around here lately! 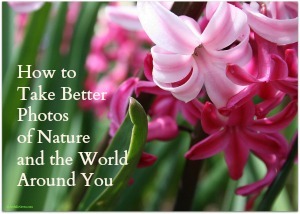 Want to learn how to take better pictures of your week? Only 3 more days for the early bird registration discount on my online photography course, "How to Take Better Photos of Nature and the World Around You." Save $15 when you enroll before midnight on Sunday! This e-course will run from July 14-25, 2014. Click here for all the details!